አሐቲ ተዋሕዶ AHATI TEWAHEDO: የዲሲ ርዕሰ አድባራት ደብረ ሰላም ቅድስት ማሪያም ቤተ ክርስቲያን የማን ናት? በእውነቱ ከሆነና እውነተኛ የቤ/ክ ልጅ ከሆንክ፤ በትክክል የማንነቷን የማወቅ ፍላጒት ካለህ ይሄንን "የማይረባና የማያንጽ፤ከፋፋይ" የሆነ ተራ ጥያቄህን እዚህ ላይ በመለጠፍ ሳይሆን እውነትን ፈላጊ ከሆንክ ለጥያቁህ በቂ የሆነ መልስ ሊሰጥህ የሚችል አካል ስላለ ወደዛ ብትሄድ የሚሳልህ ይመስለኛል። እነሱ እንደ አንተ በጓዳ ሳይሆን በግልጽ በአውደ ምህረት ላይ የማን እንደሆነች ብቻ ሳይሆን ወራሷም ማን እንደሆነ ግልጽ በሆነ ቌንቌ ተናግረውት ነበር። የዶ/ር አክሊሉ ንግግር ብቻ ነበር እንዴ የተሰማህ? ይመስለኛል አንተ ግን ለመልካም ነገር ሳይሆን አእምሮህ ፤ እግርህና አንደበትህ ለክፉ ነገር የሚፋጠንብህ ሰው ነህ። እንዲያው በእነዚህ አባቶች ላይ ያለህን ጥላቻ ከራስህ ጋር ብቻ ይዘህ መቀመጥ ሲገባህ ለምን በሌሎቻችን ላይ ለመዝራት እንደምትሞክር አይገባኝም፤ በእኑ መንፈሳዊነት እንዲህ ነው? ማን ይሆን የሰበከልህ? ታላቁ መጽሀፋችንስ ወዳጆቻችንን ብቻ ሳይሆን "ተላቶቻችንን እንድንወ ፤ የሚያሳድዱንን እንድንመርቅ" ነበር የሚያዘን የአንተ ግን ተለየ ። እንዲያው የዲሲዋን ቅ/ማ ቤ/ክ ካላነሳህ ሀሳብ አይመጣልህም ፤ ጽሁፍህ ውበት አይኖረውም ፤ አንባቢም አታገኝም ያሉህ ትመስላለህ። እንደዛ ነው እንዴ? አንድ ነገር ግን ልንገርህ? አንተ የምትፈልጋት የትኛዋን ሰላም እንደሆነ ባላውቅ ጌ/መ/ኢ/ክ የሰጠን ሰላም ግን በአመጽና በተንኰል ሳይሆን በፍቅር እንደምትገኝ አቃለሁ አምናለሁም እናት ቤ/ክኔም ይህንን ነው የሰበከችልኝ። እናም ወንድሜ ሆይ ሀሳብህ እንዲሰምርልህና ስራህም የተቃና እንዲሆን "ፍቅርህ" በዙሪያህ ላሉት ሀሳብህን ለሚደግፉት ብቻ ሳይሆን "እንደ አንተ አስተሳሰብ" የለየሀቸውንና መጥፎ አመለካከት ላለህ ለደ/ሰ/ቅ/ማ ቤ/ክ አባቶች ጭምር ቢሆን መልካም ይመስለኛል። ግን ለምንድን ነው ጽሁፎችህ ከማስተማርና ከማነጽ ይልቅ "ነገረኛነት" ጐልቶ የሚታይባቸው? ዳሩ አንተ ምን ታደርግ ! "የምለውን ተመልከት ጌታም በነገር ሁሉ ማስተዋልን ይስጥህ"
dear bloger , still you are doing under assignment for Tageye Pauls or Your holiy father. we have to agree something , still you don't undersand your fathers problem and still you are far from the truth. you live in the free world , but still you are in dark and you live in the abba Meles's friend house . 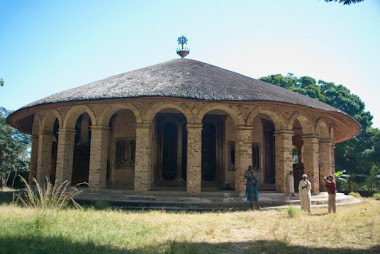 there is no synode or there no church leader in ethiopia. don't spend your time following those evil church leaders. ከዚያ ለልጁ ያለህን ጥላቻ አስወግድ ፡ ቀዳማዊ ድፍን የአቡነ ጳዉሎስ ደጋፊ አይመስለኝም። ግን ይሄ ማለት የአሜሪካ አባቶችን አካሄድ ትክክል አያደርገዉም፤ አቡነ መልከ ጼዴቅም እኮ የደርግ ታማኝ አገልጋይ ነበሩ፡ ካህናትን ለዉትድርና መፍቀዳቸዉ ተረሳ እንዴ ?! አኔ ግን አልረሳዉም ፤ ካህን ዘመዴን ስላጣሁበት !! እንዴዉም አቡነ ጳዉሎስ ሳይሻሉ ይቀራሉ ከዚህ አንጻርማ!! እኔ ምለዉ ግን ሁለቱም ጥፋት እየሰሩብን ነዉ፤ ስለዚህ መካከለኛ ገንቢ ሐሳብ እንፈልጋለን !!! I personaly appricate the bloger to tell the truth about what is going on in R.A.D.S DC. The anonymous writer seem to me some one insider in that particular church, the way he interprate things what has been said originally does not match with the idea. There is one thing we all know about Debre Selam. The fathers plus the corrapt board members there are all, they are ethier friends and family of the two clery in that church. We all know in order to be the board member or the so called (inner circle) you have to be someone from (Behata Lemariam) church in Addis or the surrounding area. There is a big corruption in that church. I can tell you a story what happen a while ago, one of my friend passed away here in the United States, as we all know people ask other fewllow Ethiopians for some fund to send the body to the deciesed parent home to our beloved country. and we approched church adminstrator about the situation. Immagine by then there was no the so called (Eder) I was a member who the adminstrator Knows me from scratch of that church washing the parking lot when it was bought at frist. The admistrator ask me who is your fiend? I told him that he used to live in Addis, then the second questions was where are his families from? by then my blood getting hotter, I told him "Kisis this is not about his family birth place or their where about, it's about scotring his body in full owner to his country" if we can ask people who will be willing to help us as we always do to other people. Then I was told the person is not our member and we can ask anyone to help you nor you can not ask anyone in this primesis of the church. I almost cry for his crulness, for God seck the person already died and its not the church who will give the fund, it's the people of our community. Since then I almost stop going over there and I do not hate him for that I simpetize for him. I have seen a lot there as the bloger specifically said at the biggning of the article. However, the anonymous writer twice, he either one of the share holder or close family of this people. We have to be away from nepotisem, you said God was crucified for all of us not specifically for those who are in that church alone. He is our saviour also. Forget the division, lets all work on our unity. Our mother church was undivided when we were given, it's not about Abune Paulos, it's the church. you may have got lots of benefite from this church more than others. However, you are the one throwing the spere towards our mother church. So please stop for a moment and think your action, your action may hurt so many generation to come. Unless we stop this division today I do not know where we all endup. WE are now figting today, think about our childeren where they would say they are belong to, they can't say they are from our home land EOTC because we show them to have an independant church like the protestants do. Where are we right now?? ?please for the sack of our church, those who burn alive for this church, who are sacrifies for this church. What would their soul would say to us today???? God help us united! amen.